There will soon be even more zombies on your lawn. That a sequel to one of the most popular game franchises in recent memory is in development is hardly what you'd call an Earth-shattering surprise, but just in case there was any doubt, EA has now made it official: Plants vs. Zombies 2, or whatever it ends up being, called, is in the works at PopCap. 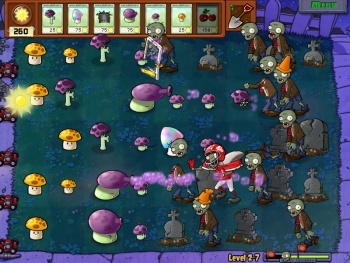 The new game will offer "a bevy of new features, settings and situations," although how it will differ from the original PvZ is anybody's guess at this point. The smart money is on "not too much," since the original game served up an essentially perfect combination of humor, variety and gameplay that managed to be challenging without sacrificing accessibility - which is to say, in less mealy-mouthed, marketing-department-jargon-ish terms, my mom and I both loved the hell out of it. There's no word yet on which platforms the Plants vs. Zombies sequel will be released (although sooner or later it will probably be "all of them") nor about how many collector's editions PopCap intends to force me to buy (although that too will no doubt end up as "all of them"), but at least we know about when to put our hands on our wallets: Plants vs. Zombies 2 is currently slated to come out in the late spring of 2013.